Bridging the gap between translation and development. You're in need of a localization solution that keeps up with your vibrant business environment? Does your current process break your agile development or continuous deployment process? Find out what locize can offer to make your localization experience a success story. Adding one line of code to your website is all needed to get started. 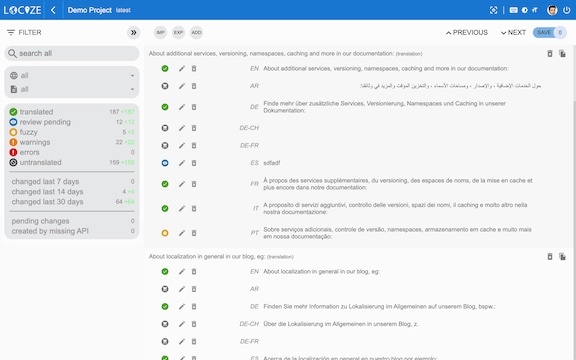 All your content gets extracted and sent to your locize project ready to be translated. Every change to your translations gets instantly reflected on your website and vice versa. Never again copy/paste translations from a to b.
Locize enables you to separate your development and translation process. 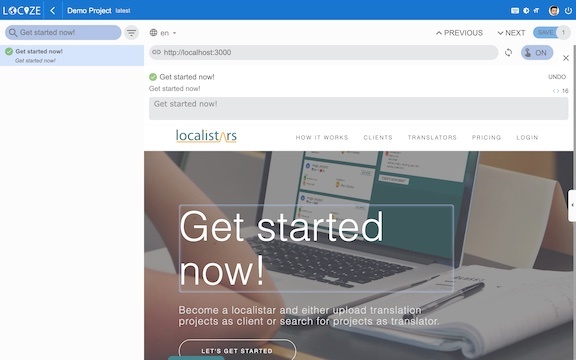 Keep translating while your development team adds new features to your project. Update translations anytime, anywhere. No longer depend on your development team adding the new translation files to the codebase. Keep track of newly added segments. Never lose the overview over your translation progress. Doing proper translations needs more information by providing the context. The best context is always the place where the content is used – your website! Our incontext editor enables you to directly update your translations from within your website. You can translate your content using our powerful editor. Invite your inhouse translators giving them the rights for the languages needed. Got a language not covered? Need extra help or prefer to completely outsource the job? Choose one of our translation service partners. 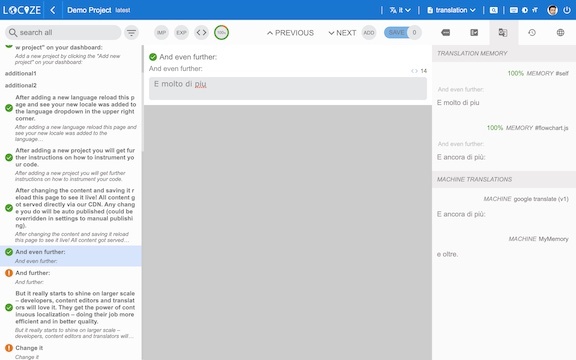 With our translation memory you never have to translate the same text again. Simply reuse your exiting translatins over and over again. By using the translation memory you not only save time but also increase the consistency of your translations. With the optional auditing service you keep track over all changes done to your projects translations. Need to provide those information - who did when change which segment? We get you covered. Locize is a great tool for us to localise our hotel software solution into multiple languages for both users and their guests. We chose Locize because of their flexible pricing structure that is based on usage instead of a large monthly fee. We already have some great early results and now our users can translate themselves into their local language! Using Locize, we have been able to translate over 40,000 key/value pairs for a significantly large application within a matter of days. It cannot get better than this. Locize has enabled Withlocals to localise effectively our website in several languages. Given that Withlocals is all about personal experiences & authenticity, being able to take over the delicate task of translating our platform’s content made Locize a valuable partner for us. Thanks to this collaboration we have been able to focus fully on the development of our product, and at the same time provide our translators worldwide with a user-friendly tool. Get translated today. Effortless & riskfree. 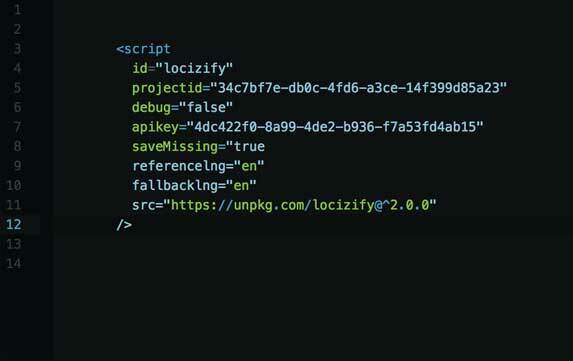 Got a small landing page or a big web application - locize gets you there! Profit from our experience. We will help you to decide for the best solution. In contrast to other solutions out there we built ours on most popular open source frameworks. If you ever plan to stop using locize your translations could be used by i18next, formatjs or polyglot. Nothing lost. Zero risk. We believe in the value of our product. No need to make you dependent by being incompatible with standards. 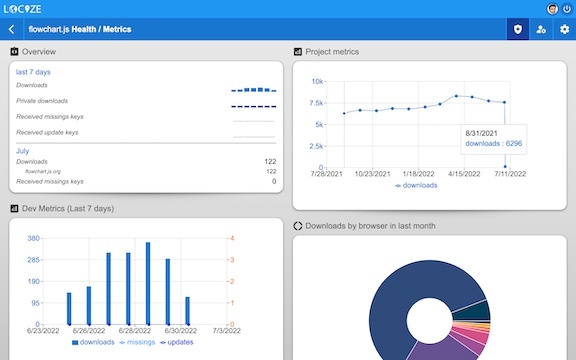 We provide you with all analytics information needed to keep control over your localization progress! Always keep the overview and keep up translating your website just in time. Never fall behind in translating your project. Stop being the bottleneck in your agile prozess. Pay for what you use. There are no intransparent plans forcing you to pay for stuff you do not need. Costs are based on your usage. Learn more using our price calculator. Find a detailed billing forecast and history on your project. Start by trying our demo generated on your newly registered account or create a new project and translate your application. * 14d free trial. No credit card needed! No obligations! Building a global business can be challenging. We will help you getting there. © 2018 inweso GmbH. All Rights Reserved.